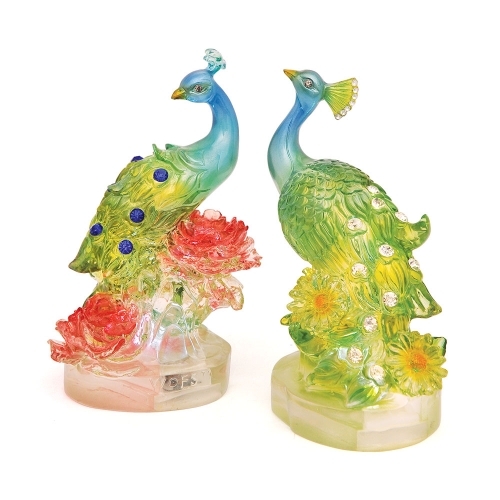 This magnificent statue features a pair of peacocks embellished with excellent craftsmanship, intricate detail, gorgeous color in a excellent demeanor. The pair of peacocks are proudly displaying their regal demeanor and glory. Birds have been widely represented and utilized in Chinese culture since antiquity. With their captivating songs and mesmerizing colors, birds are symbols of freedom, positive change, joy, and power. Peacocks are considered the queen of all birds, and their regal grace has been widely used in Asian culture and art since ancient times. As the earthly manifestation of Phoenix, the peacock represents beauty, strong relationships, eternal love, harmony, and grace. The eyes on the peacock’s tail feathers help radiate positive chi, good luck, and protection. Because peacocks often form tight loving bonds and soul mates, peacocks also symbolize purity and strong faithful relationships. Each of the feng shui peacock statue is approx. 3 3/4" x 3 1/4" x 7". Each of them has button on the bottom to turn on the light inside the peacock. They are made of resin.